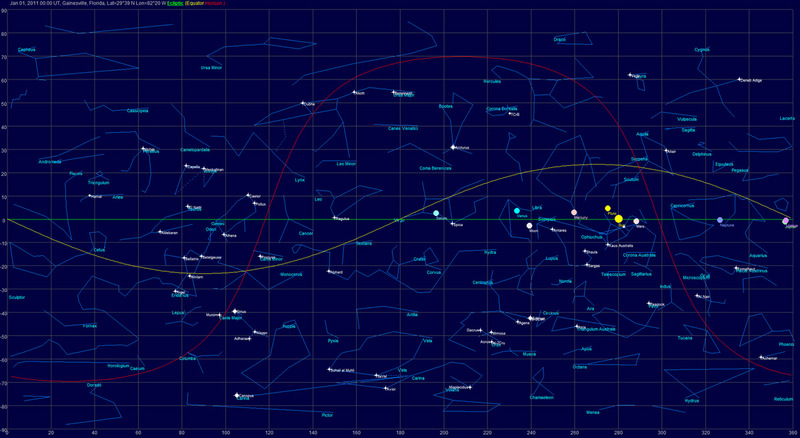 SKY MAP: A Sky Map is a map of the sky for any chart can be displayed on the screen. You can view a circular representation of the sky that was above the horizon, and another circular representation of the sky below the horizon in real time. This feature is animated. Below is the Circular Representation of the Sky Map: These circular representations give a fairly accurate image of how the sky actually looked. Because the computer screen and a piece of paper are in 2 dimensions and the stars in the sky are placed like lights inside a sphere, any representation on the computer screen or on a piece of paper is not completely accurate. Viewing the sky in 2 circular halves gives a rough approximation. This feature is animated so you can see the actual movement of the sky in real time. Below is the Circular Representation of the Sky Map: You can also view the sky in a rectangular coordinate graph as well. You can also view the planets from the perspective of the ecliptic plane or equatorial plane, as well as the horizon plane. 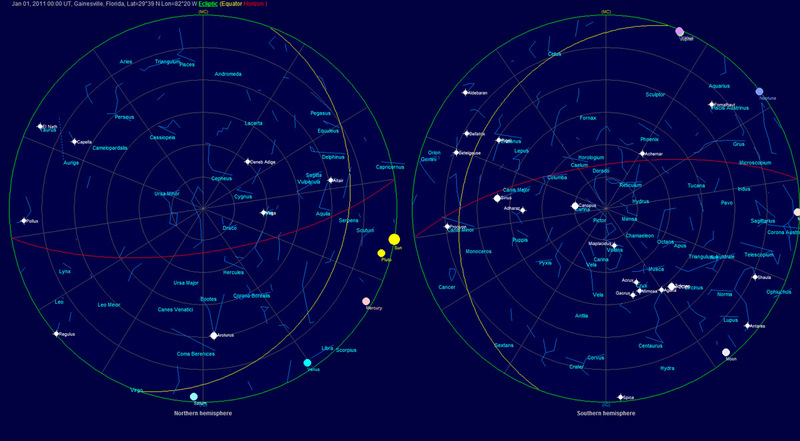 The ecliptic, equatorial, and horizon planes are also drawn in these Sky Maps, giving you a picture of how planets and fixed star positions vary depending on the coordinate system you use. This feature is animated so you can see the actual movement of the sky in real time.